I am very happy with my tst integrated taillight. aftermarket light bar that you could barely see it. I didnt even feel comfortable riding at night so i havent until now. The previous owner of my bike cut off the factory plug and play connecters that plug right into the tst taillight. Im thankful that tst industries had the oem connectors so i could plug it straight into my new taillight without having to cut my wiring all up on my new taillight. I was worried at first about getting the smoked because i didnt know if it would be bright enough. But now that i have the smoked taillight all installed its very bright even in the day light! im very happy with my new taillight! It honestly looks amazing. It looks like it should have came factory! I love the strobe brake well worth the extra $20 or whatever it was to get the programmable remember its all about riding safe and the strobe brake is good to get the attention of all the people not paying attention to us motorcyclist out on the roads. TST is the real deal and i would highly recommend it to any rider. I will be rocking the TST sticker on my bike forsure. Robert helped me out and got me everything i needed. Thanks TST! 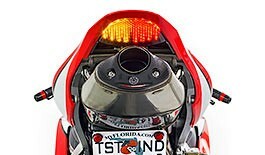 If i ever need another taillight for a different bike i will be ordering from TST. Advantages: Very bright, smoked taillight looks awesome, I like the strobe brake alot, lowering links. The youtube video is very good at explaining how to install. Disadvantages: It was kind of exspensive but its high quality so you get what you pay for! Really nice looking tail light!! Super bright! Especially at night!! Wow! Super easy installation. Only 1 little issue: left and right flasher wires were switched comparing to the ones in the installation video. Doesnt take a genius to understand what to do at this point .. I'm really happy with it!! Not happy with my order. The taillight works great, but after having it completely installed, I realized that TST did not send me the lowering link kit. They are supposed to include this in the order for free and didn't. Then when I addressed the issue, they asked for me to pay the shipping. Horrible customer service. My advice, give another company your business who will appreciate it. Hi Madsen. In an effort to not ship unnecessary lowering link kits to customers that already own one, and to know which configuration of kit to provide to those that do need it, we clearly state in both listings that it's the responsibility of the customer to add the lowering link kit to their order and specify the correct configuration (at which point, it is free in your cart). We're sorry you didn't read this notes at the several locations they would have come up during your checkout process. It certainly would have saved you, and us, the headache. Exactly what I needed! I had the stock assembly on my 07rr and on top of being a huge eye sore it was difficult to see the smaller lights the previous owner had put on. I ordered the smoked tail light and you can see it perfectly in the day time, and night time. Turn signals are super bright. The install was fairly easy, plug and play connectors and for me the hard part of getting my aftermarket exaust lowered due to not being able to fit my hands under the sub tray. I've had tst industries products before so my expectations were most definately met with each and every product! Definately recommend if you are on the fence about it. Disadvantages: Cutting the sub tray, but hey it's definately worth it. I have owned 2 CBRs. For the first CBR I decided to give a TST product a shot and I am so happy I did. I am currently in the process of ordering this tail light for my new CBR. The lights are super bright and it makes the bike look so much cleaner. Integrated tail lights are also a plus. Disadvantages: More pricy and you have to make some cuts. So let me start of by saying that this company is AWESOME!!! i came from Tampa to their shop to buy all the items (integrated taillight, flasher relay, fender eliminator, exhaust cap, flush mount halo-1 turn signals, and some crash protection stuff.) Mark helped me out and they had all the parts in stock, didn't have to wait for anything. They also showed me around the shop, new products that are in concept, race bikes...everything really. Everyone is really friendly on the phone and in person. So long story short anyone from TST will go above and beyond to help you get the parts you need and get them at a good price, and make your bike look great. I would like to thank again Mark, Bart, and Steven for all the hospitality. I ordered the intergrated in tail light with clear lens. I was worried about how bright it would be during the day because of some other companies products I've seen. Not a problem with this product. It's super bright and was easy to install after watching video. Product was a little pricey but it's worth it for the quality and quick shipping. Advantages: Clear instructions and easy install. Super fast shipping and exhaust lowering kit looks cool too. Great Product. Looks AMAZING. Very bright and visible. Will recommened this to anyone. I plan on buying more products from TST. Took 20 minutes to install. Had Bart install mine on my 09cbr600rr and it looks great! Deff worth getting. Great product! Looks great on the bike! Easy to install! A lot of people wonder if this light is bright enough in the daytime, IT IS! This is definitely one of the best things you can do to your bike, it makes the back end look 100 times better. Thanks again!